The Climate Policy reflects SCOR’s longstanding and ongoing commitment towards achieving climate resilience. 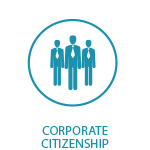 At SCOR, we believe that stakeholder value is every bit as important as shareholder value. We care about all of our stakeholders, and about society as a whole. Creating shared value is part of the way we want to do business. A signatory of the United Nations Global Compact and the Principles for Sustainable Insurance (United nations for Environmental Program - Finance Initiative), SCOR constantly strives to create this value, basing its efforts around five pillars: a robust governance and compliance framework, a human capital policy based on global, harmonized and non-discriminatory principles, preservation of the environment, ethics and transparency measures, and corporate citizenship. With these five pillars, we are committed to a shared value approach through Corporate Social Responsibility, in the interests of the company and all its stakeholders. SCOR is particularly attentive to the adoption of rigorous corporate governance principles, which contributes to the excellence of its Enterprise Risk Management. 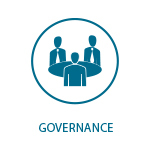 Sound governance principles are a priority for the Group, which in 2008 adopted the Corporate Governance Code for listed corporations published by the AFEP (Association française des entreprises privées) and the MEDEF (Mouvement des entreprises de France) (hereinafter the "AFEP-MEDEF Code") as its corporate governance code of reference. As SCOR is always improving its governance, a new Corporate Social Responsibility committee was created on 24 October 2017 in order to leverage on the pivotal role of boards in terms of ensuring that corporate strategies are consistent with a company’s long-term sustainability. Alongside financial capital, human capital is a crucial resource for a reinsurer. Financial capital ensures solvency, while human capital ensures profitability. Solvency and profitability are the Group’s two main objectives. We manage both financial and human capital extremely carefully. In this sense, one of SCOR’s competitive advantages resides in its ability to attract, mobilize and optimize the skills and talents available, so as to achieve excellence in terms of expertise. In a market as competitive as reinsurance, it is human capital that will make us stand out, by enabling us to provide suitable, personalized and optimized solutions to all of our clients. 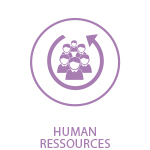 SCOR’s human resources strategy is based on a rigorous, rational approach designed to enhance the technical skills, leadership and performance of all those who contribute to its development. The SCOR Group believes that (re)insurance, when paired with strong liability laws and regulations, is a highly effective tool to promote sustainability. 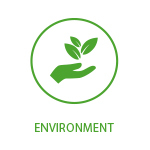 Consequently, SCOR upholds Sustainable Development as one of its five core values. This belief is anchored in our Code of conduct. It is also embodied in the international commitments and initiatives related to the environment we have embraced for many years. Being a signatory of the UN Global Compact and of the UNEP-FI PSI from the outset, SCOR acknowledges the high relevance to its business of the Sustainable Development Goals (SDGs) set in 2015 by the UN Agenda 2030. SCOR also supports international sectoral climate-related initiatives such as the French Business Climate Pledge signed in the wake of the Paris Climate Agreement, the Geneva Association’s Climate Risk Statement on Climate Resilience and Adaptation, and more recently the Decarbonize Europe Manifesto and the Letter of global investors urging governments of the G20 nations to fully support and implement the Paris Agreement. SCOR’s Climate Policy reflects this longstanding and ongoing commitment towards achieving climate resilience. It aims to provide a dynamic framework for the management of our own environmental impact - both direct and indirect - as well as an active strategy based on our expertise for addressing the many risks and opportunities posed by climate change to our business. SCOR has set an indicative objective of 15% reduction in carbon intensity of its offices per employee by 2020, through the reinforcement of its energy efficiency, an increased share of renewable energy in its energy mix and the further rolling-out of environmental management systems across all of its main sites. Over the past few years, the Group has implemented certified environmental management systems and it has carried out energy efficiency audits on its major locations. As at the end of 2016, more than 52% of the SCOR group’s employees were already working in offices equipped with a certified environmental management system (ISO, EMAS, and HQE), while the share of renewable energy in its electricity purchases reached 48%. 1 - Including so-called radiative force and the greenhouse gas emissions stemming from other tenants at SCOR's premises in some of our locations. Further information on the scope and the methodology used for the calculation of our greenhouse gas emissions is available on SCOR's registration document. Over the past 6 years, SCOR has pursued a real estate investment policy that generates value for both its shareholders and Society as a whole. Indeed, the Group has implemented a proactive strategy that includes the acquisition of environmentally certified offices and the implementation of far-reaching renovation programs with green targets. The Group owns one of the very first large positive energy office building in France, and invests in low carbon projects through its debt funds. SCOR has set itself the goal of investing more than EUR 500 million in energy efficient corporate buildings and infrastructure by 2020, while integrating carbon considerations into the other asset classes under its management. Beyond climate change mitigation, SCOR also actively plays its part in supporting climate change adaptation strategy through conceiving, trading and investing in financial products that provide additional capacities for the coverage of natural catastrophes (“Cat bonds / Insurance Linked Securities”. This activity is developed by its asset management subsidiary, SCOR Investment Partners, which is a signatory of the United Nations Principles for Responsible Investment since late 2016. As announced during the presentation of its strategic plan "Vision in Action", the Group has initiated works to further analyze climate challenges related to its asset portfolio. Several aspects are being investigated such as the so-called “stranded assets”, the portfolio positioning with a 2 degrees scenario, and the measure of the asset portfolio carbon footprint. SCOR supports a broad range of initiatives designed to advance knowledge on the impact of climate change on society, while contributing to climate change resilience. Indeed, as a reinsurer, not only does the Group contribute to climate change mitigation and adaptation through its investment function, but it also, and most importantly, contributes to adaptation through climate risk understanding and modelling. The Group’s support for climate change adaptation strategies is backed at the highest level of the company. SCOR’s Chairman and Chief Executive Officer has co-chaired the Geneva Association’s Extreme Events and Climate Risks working group since May 2015. SCOR closely monitors developments in the arena of climate change, notably as part of the steering of emerging risks (via the Group’s Emerging or Changing Hazards’ Observatory), but also through the enhancement of its climate risk capabilities. SCOR also supports a collaborative approach, as illustrated by its very early support for OASIS, a British non-profit organization developing an open source platform for the modelling of climate events. The Group has also joined Climate-KIC, the largest public-private partnership in the field of innovation designed to combat climate change. SCOR's Corporate Foundation for Science is also involved in the promotion of climate research. In 2015, the Foundation organized a scientific conference combining a range of disciplines (climate, economics, actuarial), with a keynote speech delivered by Jean Tirole, winner of the Nobel Prize for Economics. This conference was awarded the COP 21 label. In collaboration with the Geneva Association and with the technical support of the Group’s teams, the SCOR’s corporate Foundation for Science has decided to organize a second event on risk modelling, including climate risks, and how it can contribute to the development of risk transfer mechanisms. This conference, which was hosted in the premises of the Group in March 2017, explored what has been learnt from 25 years of developing and utilizing catastrophe risk models. It also look at the next generation of the risks models being currently developed. The conference also debated how the latest advances in climate and earth observations could be harnessed for designing the next generation of forward-looking models and how these models could stimulate the expansion of insurance coverage to the overall population. Insurance and reinsurance can contribute to climate change adaptation. Expanding insurance coverage to the most vulnerable developing countries is a primary focus of the Insurance Development Forum’s work, a multi-stakeholder group gathering insurers, reinsurers, international institutions (the United Nations, the Word Bank) and other stakeholders. SCOR’s Chairman and Chief Executive Officer is a member of its steering committee and SCOR’s teams contribute as they participate in its working groups. SCOR is committed to conducting business with the highest degree of integrity, professionalism and responsibility. 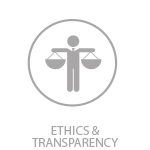 This commitment to a strong ethical and compliance culture is vital in terms of meeting the long-term interests of SCOR’s various stakeholders, and reflects the “tone at the top” established by SCOR’s Board of Directors and senior management for the prevention and mitigation of compliance risk. SCOR's Code of Conduct covers numerous fields, and notably reminds employees about the ethical and legal rules applicable to business confidentiality (including data protection and privacy), to the use of inside information and to financial communications. It also reminds them about the crucial values of non-discrimination, respect and loyalty practiced within the Group. It defines the rules relating to the acceptance of gifts and invitations, and emphasizes the “Know Your Customer” (KYC) principle as a key way to protect the company against compliance risk. As part of its compliance program, and in order to embed the Group’s compliance policies and latest developments, SCOR regularly holds training sessions for its employees in most of its Hubs and other locations. SCOR is also active in various compliance organizations and transparency initiatives such as the Group Chief Compliance Officer Forum, the Sanctions in Insurance Roundtable (SIIR) and the Sustainable Development Commission of the French Insurance Federation (Fédération française de l’assurance). Key areas of basic legal and ethical obligations towards clients, shareholders, business partners, the financial markets and towards each other. SCOR has a longstanding tradition of corporate citizenship, aligning its global involvement with its business activities, its corporate values and its tagline, “The Art & Science of Risk”. Over the past few years, SCOR has committed more than 12 million in cash to the support of science, education and academic research, either directly through various kinds of partnerships with well-known universities and research centers, or through its dedicated foundation, the SCOR Corporate Foundation for Science. SCOR nurtures scientific vocations, building a network of young talent with skills relevant to the long-term success of the Group and the (re)insurance industry. This includes the organization of the SCOR Actuarial Awards, the financing of a two-year training program in Africa to develop actuarial sciences in the region and the sponsorship of a Young European Researcher prize for Alzheimer's disease research. In 2017, the 4th edition of this prize was awarded to Dr. Niklas Mattson of Sweden’s Lund University. SCOR fosters Risk Dialogue within the industry and spread knowledge to the wider community, in order to help build resilient societies. The Group does this through training workshops for its clients (SCOR Campus) and specialist publications, a cycle of monthly conferences, and SCOR Corporate Foundation for Science conferences. Esprit de Corps is an initiative launched by SCOR employees based in the US that aims to enrich the Group’s employees’ work experience in a variety of ways throughout the year. Esprit de Corps is commonly used in English to mean “group spirit.” Each month, employees are given the opportunity to focus on charitable activities, giving employees the opportunity to contribute and participate in corporate sponsored charitable endeavors, both locally and nationally. "Esprit de Corps" and its activities are also conducive to the company’s management principles of collaboration, respect, pride and transparency. Across the board, Esprit de Corps very aptly defines “group spirit” at SCOR. SCOR supports the Orchestre de Paris in France and the Wallraf-Richartz Museum in Cologne, and has also sealed a strategic partnership with one of the most famous museums in the world, the Louvre. Created in 1981, this association brings together music lovers and companies wishing to support the Orchestre de Paris in its artistic and cultural policy. In particular, it furthers the orchestra’s influence in France and abroad, as well as organizing campaigns designed for younger generations. SCOR is a loyal supporter of the Orchestre de Paris, Denis Kessler, Chairman and CEO of SCOR, having chaired this association since 2008. SCOR supports one of the oldest museums in Cologne and one of the main photography galleries in Germany. Along with the works of the Fondation Corboud, the Wallraf-Richartz Museum owns one of the largest collections of impressionist and neo-impressionist art in the world, as well as the largest collection of medieval paintings.